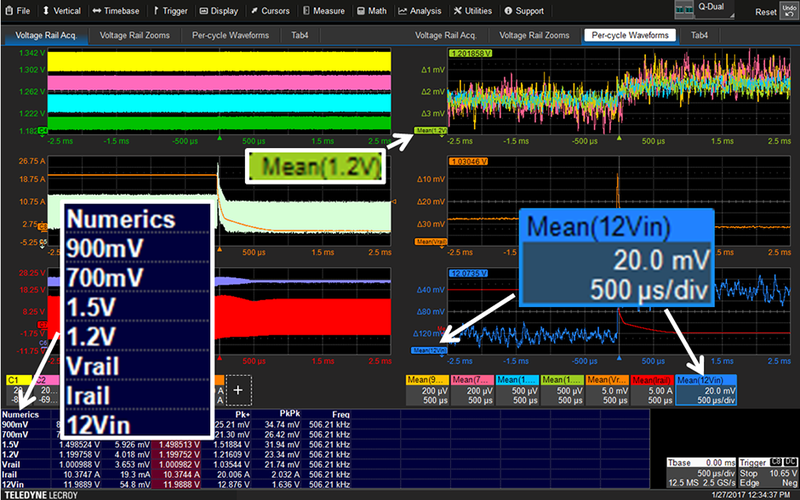 Teledyne LeCroy Digital Power Management Analysis Application Software translates complicated multi-phase PMIC, VRM, POL, LDO and other DC rail behaviors into per-cycle measurements and displays per-cycle Waveforms to provide complete and fast understanding of DC-DC converter power system behaviors. Optimally used with the RP4030 Active Voltage Rail Probe. Various measurements can be selected for display in a mean value table. RMS, Sdev, Mean, Pk-Pk, Pk+, Pk- and Frequency are supported. Mean values are calculated over a user-defined cyclic period. Touch a mean value and a per-cycle Waveform is instantly displayed. Understanding power system behaviors over time is key to cause-effect analysis. These waveforms make it simple to identify and quantify behavior changes during transient load events. Capture long acquisitions and Zoom+Gate the per-cycle Waveforms and Numerics table values with instant table value updates. Quickly understand DC power/voltage rail and load current behaviors. Rename sources for all measurements to something specific to your design (e.g., POL1, VrailA, 1.5Vdc, etc.). These names are carried into the Numerics table and per-cycle Waveform displays.